The Toy Fox Terrier may be a member of the toy group but it is a feisty little character! It happens also to be a terrier! The breed tends to be on the edgy or nervous side and might not be the best bet for families with toddlers or young children. 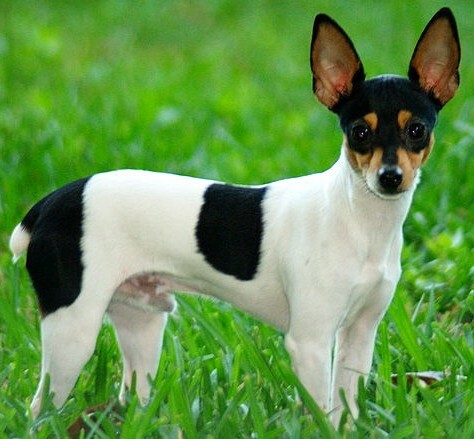 The breed looks a bit like a Rat Terrier with those huge antenna like set of ears but the Toy Fox Terrier is a fragile little dog mainly because of those spindly, thin legs. Injuries could occur if the dog were to be dropped or stepped on by young children. The Toy Fox Terrier is super agile. It loves to jump up and down and would enjoy a couple of hours on a trampoline if it could figure out how to do it! With all the jumping around, I am surprised that they don’t dislocate their hips more frequently! The Toy Fox Terrier is a very small dog and would do well in any home environment. They would make a good pet for adults that live alone or for a senior citizen looking for companionship. Because they are a hodgepodge of breeds mixed together, the Toy Fox Terrier is a healthy dog. Its main medical issues are those associated with the majority of the toys such as left sided heart failure, floating or luxated knee caps (patella) and periodontal or dental disease. The breed would make a great small pet for someone that enjoys a super energetic breed of dog! They hate cold weather and snow so make sure you put a winter jacket on them! Learn more about the Toy Fox Terrier on Animal Planet’s® Dog Breed Selector.